My Life: The Billy Joel Experience – Long time Broadway and film veteran Donnie Kehr’s explosive performance as Bill Joel electrifies audiences with its energy and authenticity. In this show, Kehr brings to life Joel’s number one hits: SCENES FROM AN ITALIAN RESTAURANT, ONLY THE GOOD DIE YOUNG, JUST THE WAY YOU ARE, MOVIN’ OUT, along with countless others. And you can be sure from his originating roles in numerous award winning musicals including Jersey Boys, The Who‘s Tommy and Billy Elliot: The Musical that Donnie entertains an audience like no other. 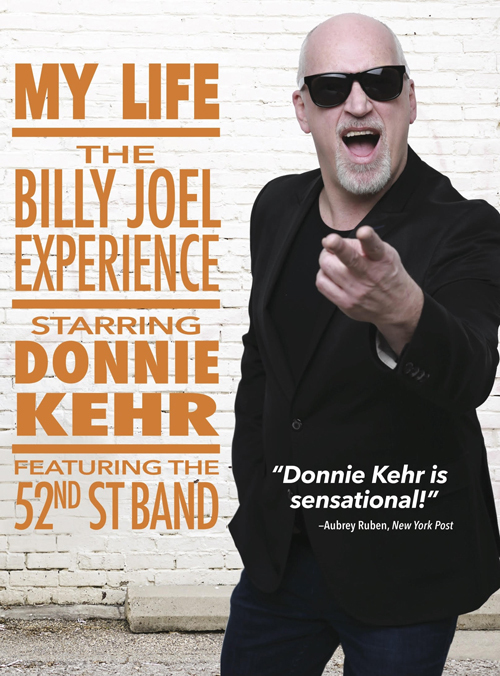 Don’t miss to his unmatched portrayal of Billy Joel in this spectacular stage event featuring the 52nd STREET BAND!